Divorced parents Joe and Mimi confuse son Tom about the morality of befriending losers. Stars David Tennant and Sarah Alexander. From May 2011. 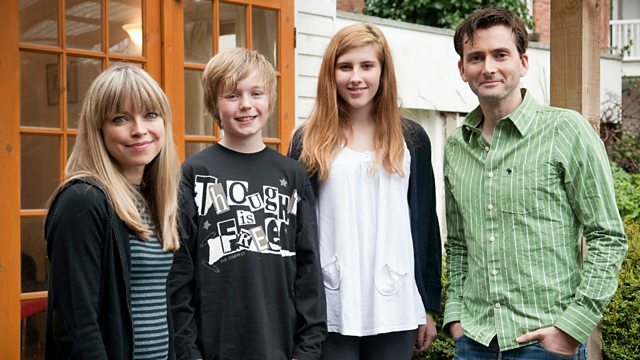 David Tennant and Sarah Alexander star as the exes determined their marital failures will not get in the way of good parenting. This week son Tom feels guilty about not wanting to be mates with a boy with a permanent snot bubble. The divorced pair confuse him about the morality of befriending losers. Meanwhile a visit to a tattoo parlour gives Lucy a great idea about getting some attention. Joe finds a new job and a visit to The Wellcome Institute provides Mimi with some useful information about Syphilis.